Payroll Vault is re-defining how you think about payroll, which is why we’ve emerged as a national leader in payroll services. Our seasoned experts serve as your ‘internal’ payroll department—fully handling the complex, compliance-driven payroll tasks that take your focus away from running your business. 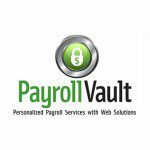 Payroll Vault applies today’s most advanced cloud-based technologies to provide clients with the highest quality payroll service, supported by unparalleled customer service. Now that’s payroll re-defined!